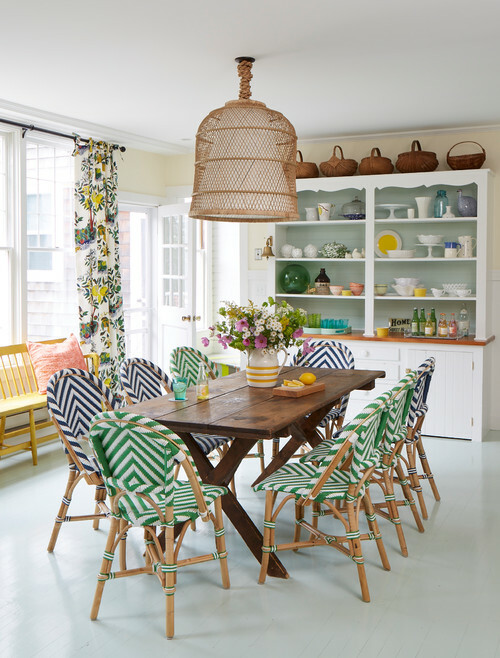 Fans of color are going to enjoy touring this colorful beach cottage! 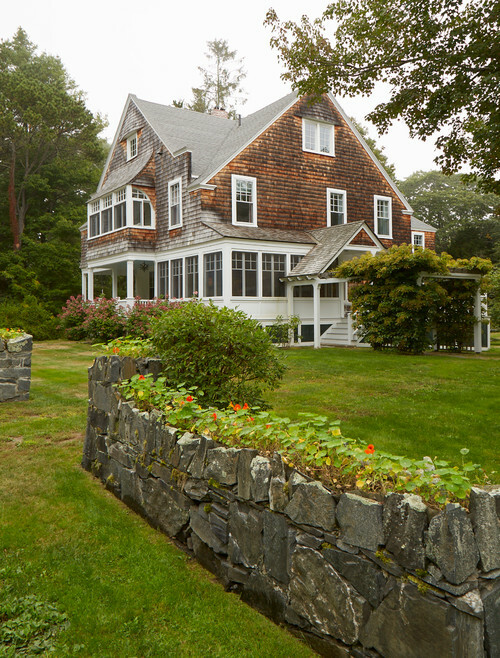 Outside, cedar shake shingles pair with white to create a classic vacation home that can be lived in all year. A stone garden wall planted with cheery nasturtiums invites you to the front door. 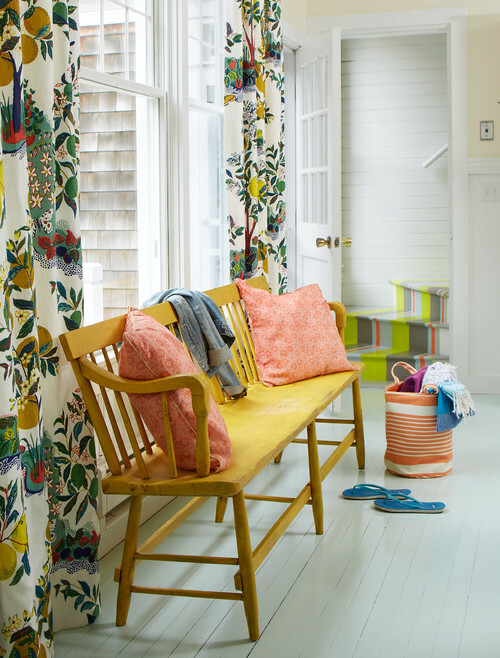 Brightly striped stairs pull colors from the patterned curtains while a yellow bench provides a place to toss off your flip flops after a beach-combing stroll. Painted floors make it easy to sweep up the sand. 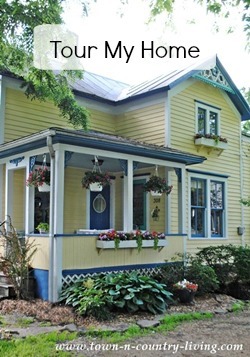 This home is filled with quaint porch spaces. 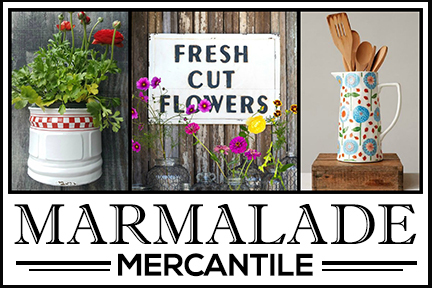 A sunny porch is a great place to start your day with morning coffee and a scone. 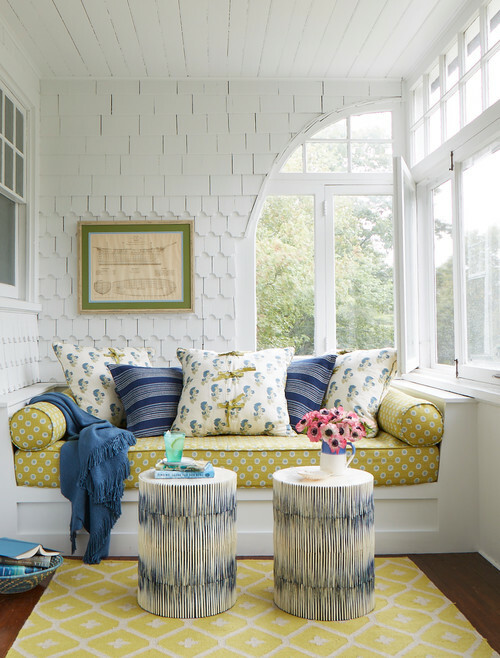 Blue and yellow fabric patterns combine to create a fun cottage vibe. 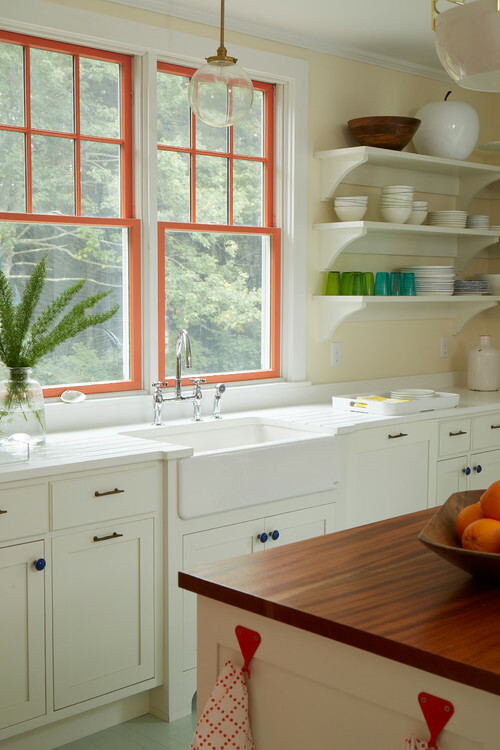 Two-toned windows in white a coral set the stage for a colorful kitchen. Blue kitchen knobs and green and aqua glasses on the open shelves show that you can pair a variety of colors with a white background, and provided the touches of color aren’t too overwhelming. Did you notice the fun apple on the open shelves? The dining room keeps the fun color scheme going! Blue and green striped chairs gather ’round a farmhouse table while a basket pendant light illuminates the room in the evening. More baskets line the top of a cupboard filled with dishes and vases. 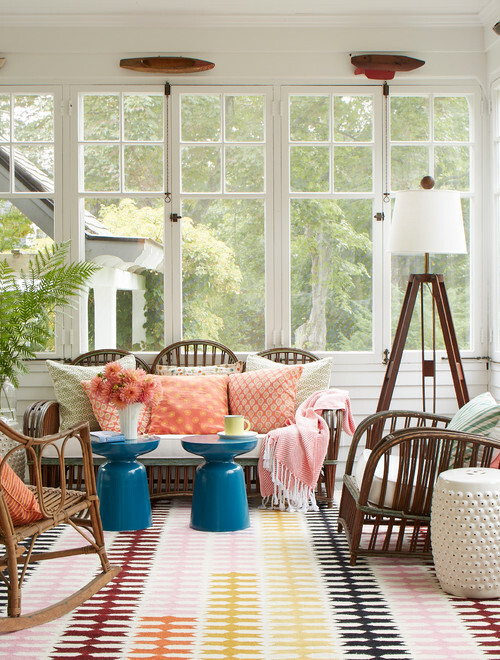 Rattan furniture with bright cushions create a cheerful space in the sun room of the colorful beach cottage. The rug is a perfect complement! 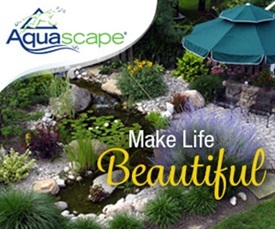 An expanse of windows lets you enjoy the scenery and nature outside. The home’s main stairway is a work of art with its wood steps and white railings. The beautiful master bedroom wears a base of white with blue and apple green accents. Love the ceiling and the door with the little windows! A cozy nook makes for a pretty office area. A second bedroom pairs soft lavender with white to create a summer bedroom. 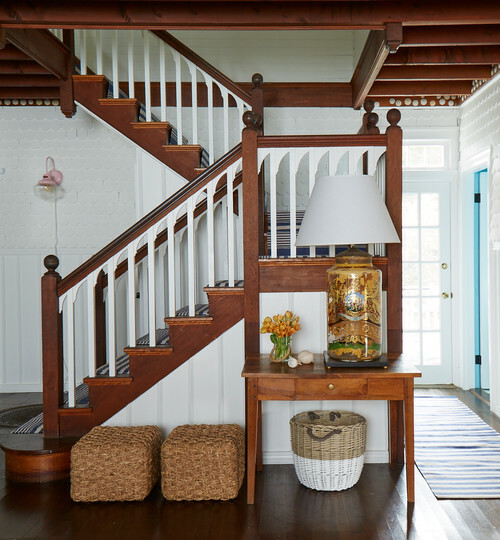 You can see more of this pretty, colorful beach cottage by Wright-Ryan Homes over at Houzz. Charming home! You find the best houses…ones I would like to have transplanted to my location! 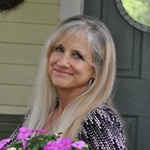 Thanks, Donna! Sometimes I wonder if I should show houses that I might not personally like. I tend to choose houses that I could live in. LOL. I love all the white with added color that is easy to change. Thanks Jennifer it’s a lovely home. So glad you like it Marlene! I agree with you – it’d be easy to change out accent colors in this home! Adorable tour. So many cute accents. The bathroom door, painted floors, windows with paint on the inside… so stinkin cute! I love this home, but always have to smile at the use of the word “cottage” for these huge spaces. I agree, Pat! I remember when the new Cottage Living magazine came out years ago and I thought “finally a magazine that features smaller homes!” Nope. The majority of the houses were large and I thought that was so odd.